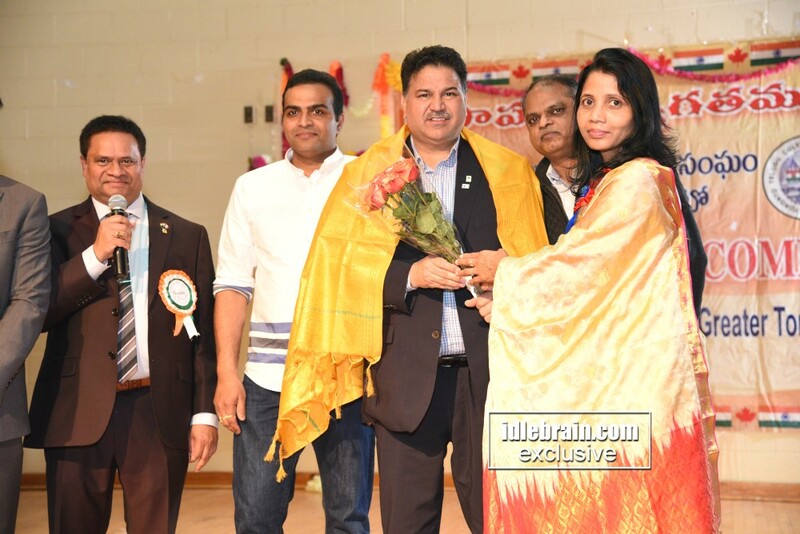 The Telugu community of Greater Toronto Area made mega Ugadhi Celebrations successful with great enthusiasm at Bishop Allen Academy Catholic Secondary School in Toronto, Canada. 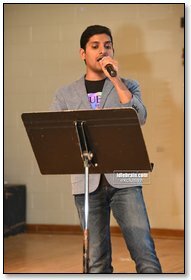 Hundreds of Telugu families from surrounding cities Toronto, Markham, Brampton, Mississauga, Oakville, Waterdown, Kitchener, Waterloo, Cambridge, Hamilton, Milton and other areas have joined the five hour long program that is packed with music, drama, dance, comedy and many more. Event started with Socialization. 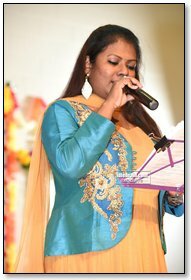 Received remarkable responses from the participants with a glow of happiness and sparkles of joy in participating this event successfully with full of family entertainment. Everyone enjoyed great varieties of South Indian food delights. 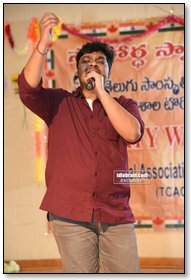 The venue and stage was decorated by Govardhan Konda, Baradwaj Kanakagiri with the help of Anitha Bezawada and several other volunteers. Colorful floral designs welcoming the Telugu Cultural Association of Greater Toronto (TCAGT) Guests, Sponsors, Members, Families and Friends. The festival has begun with "Deeparadhana" by Sridhar Munduluru, Divya Donthi, Executive committee members, Trustees, and the event Sponsors. Lighting the traditional Indian lamp and Lord Ganesh Prayer Song and Canadian National Anthem O Canada. 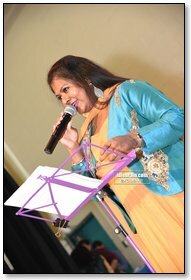 TCAGT Secretary Devi Chowdary delivered the welcome address and highlighted the Ugadhi event activities, unique programs that were presented to the community this year. Founders and Life members of the association envisioned to pass this for generations to come through this great platform. 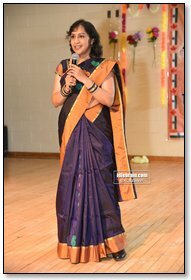 She then introduced the Master of Ceremonies Vamsi Raj Sangamreddy and Swati Kanakagiri who lead the evening program. 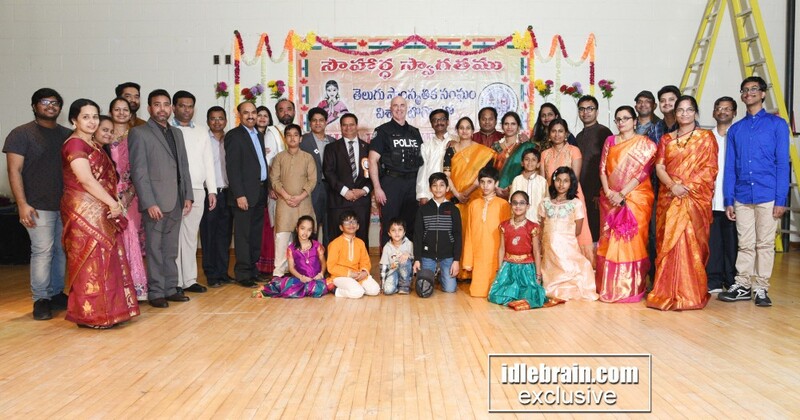 President Koteswara Rao Polavarapu informed the Telugu Community for the outstanding services that have been provided through all the thirty years of Telugu Cultural Association of Greater Toronto (TCAGT). 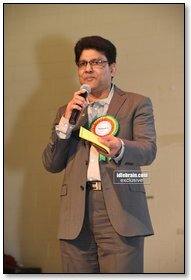 He spoke about the TCAGT platform that provides the opportunity for the new immigrants to network, make new friends and to preserve the Telugu Cultural heritage in Canada. 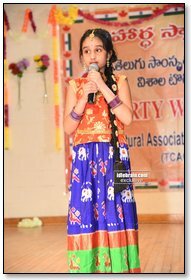 Telugu families were able to pass on the Telugu Language, Culture and Festive experiences to the kids and Canadian Youth to embrace. Basavaiah Velivolu, Community leader who held many leadership positions in Bharathi Kalamanram, Richmond Hill Temple, and other national organisations share his experiences from his 40 plus years of residing in Canada. That time there were only 3 to 4 families from Telugu origin. Now more than 30,000 plus families living in Canada. He applauded the services rendered through TCAGT platform. 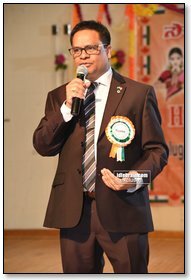 Chairman Board of Trustee Surya Bezawada delivered his address. He acknowledged the executive committee members, trustees, sponsors and volunteers for their tremendous efforts in organizing the event. 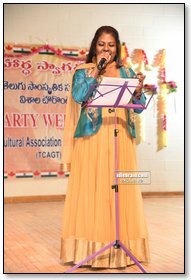 Without memberships and sponsors help, TCAGT would not been provided the extraordinary service to the Telugu Community through this association. He invited the audience to join the TCAGT team to further enhance the organizational growth in finances as well as in numbers. He introduced the guest of honor Murarilal Thapliyalji. He shared the amazing success journey the guest and Muralilji's outstanding achievements in India and abroad. Murarilaji is now the elected candidate nominee for 2019 Member of Parliament from the conservative party in Canada. He delivered key note address and applauded the support and services provided through this multicultural organization in Greater Toronto Area. He mentioned the immense support he received from Telugu Community in winning his nomination for Brampton West Parliament riding. He promised the continuous support to TCAGT in all means in his capacity. Spice Inn served the traditional delicious festive food items to the attendees. 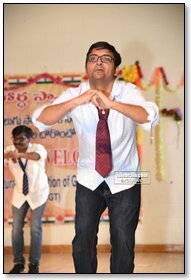 Spectacular dance performances choreographed by professionals enthralled all the ages of the community members. 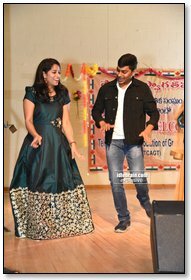 Mega musical night was performed by most energetic singers Venu Madhav and Vamsi Priya from USA along with professional singers Sharmila Ganeshan, Sai Krishna and Sai Kiran. 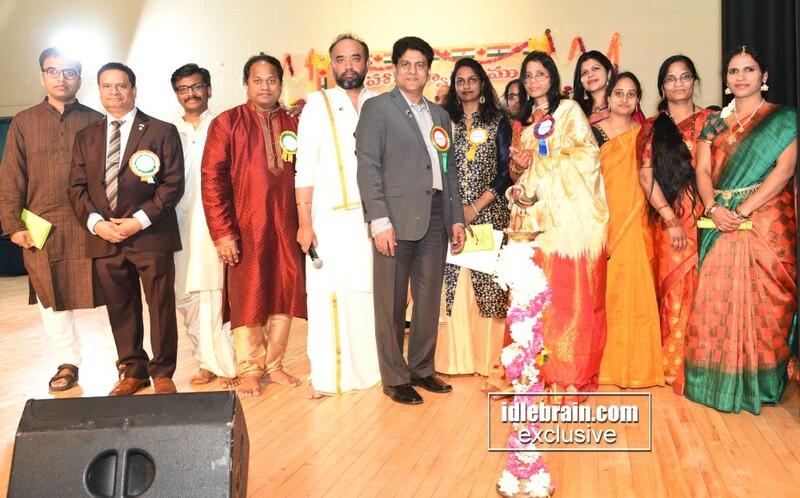 Many attendees acknowledged the executive committee for preserving, promoting Telugu language and culture in Canada. Prior to the start of the event, TCAGT in collaboration with Global Telugu Lions club organized Special Crime Prevention and Safety Workshop. Crime prevention Police officer William Ross from 22 Division who has 32 years of experience working in uniform conducted interactive session. People learned this workshop on personal safety, home security, vehicle security, frauds and internet safety. Lot of tips were given to Telugu community members in the event of emergency and where to reach for help. 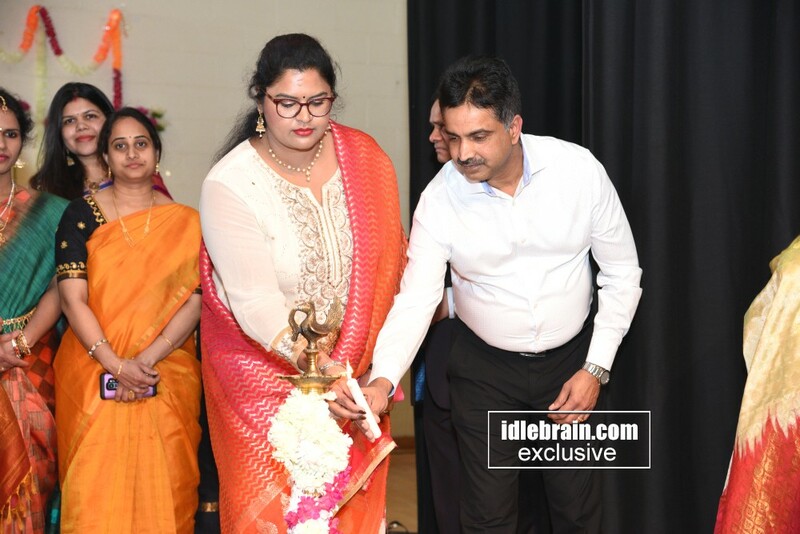 Global Telugu Lions club president Kamakship Perugu thanked the officier and TCAGT for organizing this unique workshop at the event. 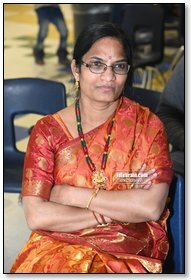 President Koteswara Rao Polavarapu announced the below committee for organizing 30th anniversary celebrations in Toronto, Canada. Further details will be followed in few weeks. Vice Chairmans are Surya Bezawada, Bose Vemuri, Rao Vajha, Vamsiraj Sangamreddy, Sudha Vemuri, along with EC and Trustees. He invited all the interested members to come forward and join the organizing committee. 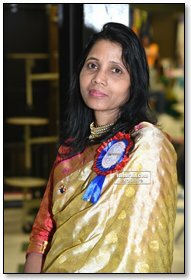 Secretary Devi Chowdary provided vote of thanks and TCAGT event ended with chanting of Indian National Anthem. Indeed, the event has brought fun, excitement and high performance with a great fun.